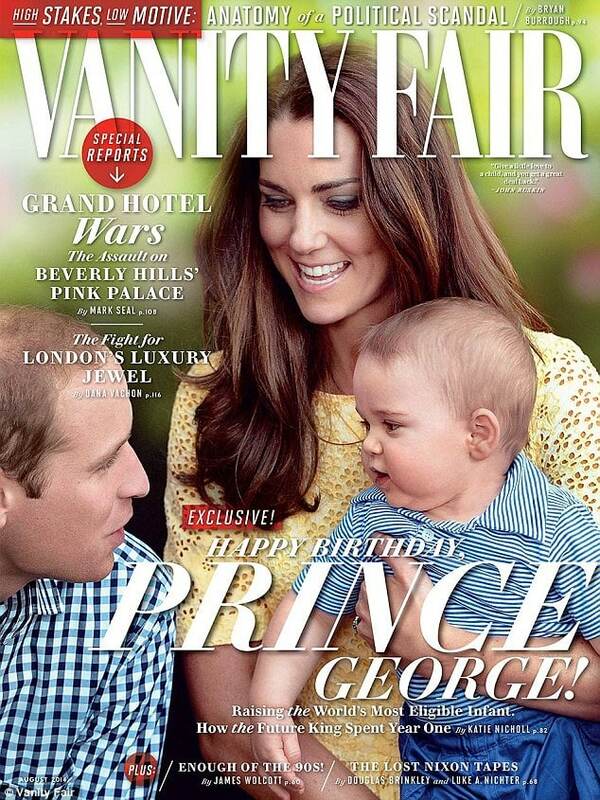 Vanity Fair accused of photoshopping Prince William's thinning hair. 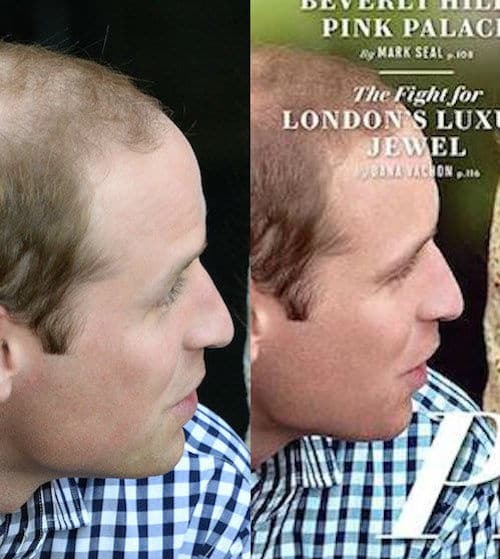 Home Scandal and Gossip Vanity Fair accused of photoshopping Prince William’s thinning hair. 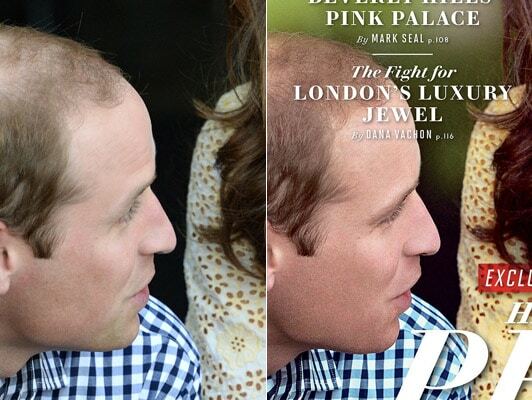 Vanity Fair accused of photoshopping Prince William’s thinning hair. So why does the media go out of its way to photo-shop royalty and celebrity to preferred visions anyway? It seems Vanity Fair has taken umbrage with Prince William, the Duke of Cambridge‘s palette of thinning hair as the journal has come in for some heavy criticism after readers took to criticizing the journal’s decision to make the Prince’s hair appear more fuller in a new cover depicting the Prince, his wife Kate Middleton and their son, Prince George during their recent tour of Australia. What will the royal baby look like when it grows up? The image which glosses the cover of the upcoming August edition of American Vanity Fair shows Prince William smiling from the side on as he and Kate Middleton take pleasure in their son. But it’s the comparison of the original image versus the doctored image which has some wondering as the original image shows Prince William with much less hair than that of him on their cover. A spokesman for VF told the UK’s Telegraph that it had altered the photo but that it had not added more hair to Prince William’s head. Reiterated the spokesman: ‘We gave the image a poster-like palette. Because it is a cover image, the colours are richer and more graphic and vibrant. We obviously did not add more hair. Also not spared by the way the media has chosen to represent the royals, were images of Kate Middleton by Grazia magazine who took to airbrushing her waist during pictures of the royal wedding, while US Weekly was also accused of manipulating a photo of their son Prince George, who turns one on July 22. Historian Dan Snow told the Telegraph that retouching images of the Royal Family was historically about highlighting the positive parts of a royal. Nevertheless some of us in the media have been left wondering by the media’s insistence of portraying royalty and celebrity in ‘preferred terms’ and why such phenomenons continue unabated?